Amy Marcs in "Nice T!ts", Photo Credit: Colleen SturtevantAmy Marcs' Nice T!ts at The PIT Loft in NYC has it all...heart, laughter, and Barbie dolls! I never thought a show about one's journey with breast cancer would make me laugh, cry, and then laugh even more, but that's just what Nice T!ts did. Amy took one of life's lowest blows and came back swinging her way to champion! Amy has created a show that everyone can relate to. In just one-hour's time, Amy took us through every step of her breast cancer, from the day of diagnosis all the way through her double mastectomy and beyond. She took us to support groups, doctors offices, Toys 'R' Us, and even to bed. She left no detail out. What made this show so awesome was the way Amy infused her brand of comedy throughout the really tough moments. One minute I was getting emotional during her surgery and the next moment I was rolling with laughter as Amy cracks a joke about how she was feeling the following day. Amy Marcs, Photo Credit: Juan Felipe Rangel Amy Marcs in "Nice T!ts", Photo Credit: Colleen SturtevantAmy painted the grim picture of breast cancer perfectly, while infusing a rainbow of colors from her genius performance skills. It's like Amy mentioned in our interview together, she was able to make light of her breast cancer pretty quickly because she is a performer and I have to say, she's a damn good one! My favorite part of Nice T!ts was a whole montage and interaction with Barbie. Amy brilliantly used Barbie as a symbol for what she was going through when preparing for her double mastectomy. The writing, the use of video, and the way Amy interacted with Barbie was all spot on. It was so interesting to hear the comparisons between Barbie and the process a woman goes through while getting ready for a double mastectomy. Nice T!ts never diminishes the seriousness of breast cancer, it just finds a way to make it a little easier to digest. 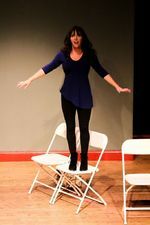 Amy Marcs, Photo Credit: Cassidy Horn Amy Marcs in "Nice T!ts", Photo Credit: Colleen SturtevantWritten and performed by Amy Marcs with direction by Peter Michael Marino, Nice T!ts has just 3 performances left. I highly encourage you to go see this show! Nobody wants to talk about cancer, so why not be entertained by it! Nice T!ts will play at The PIT Loft (154 West 29th Street, between 6th & 7th Avenue) Sunday, 10/16 at 4pm, Monday, 10/24 at 8pm, and Thursday, 10/27 at 8pm. Click here for tickets! If you missed my interview with Amy Marcs, you can read it here!